Sound "The Phiaton MS 400s have a smooth overall sound with no rough edges that jarred me out of the sonic bliss they induced." "If I had to compare them to a full-sized loudspeaker, it would be a Lowther model. Lowthers are single-driver speakers that, together with a low-power amp, have subdued highs and lows but offer a glorious midrange." "As is usual with most closed-back headphones, the soundstage is a bit constricted. Yet the MS 400s offered good definition within the space they allotted for the instruments to inhabit." Features "The MS 400s are on-the-ear headphones -- sort of. While they are far smaller in circumference than full-sized headphones, their oval shape is also slightly larger than most round on-ear models." "They have decent-sized 40mm drivers and can accept up to 1000mV of output power. They offer a low impedance of 32 ohms along with a highish sensitivity rating of 98dB. This means that they should be able to be used with an iPod at little or no sonic penalty." Use "These 'phones do not use electronic noise canceling, but they still kept a majority of outside noise from reaching my ears. They do an even better job of keeping the music inside with little leakage of sound in, even in the quietest environments. I could listen to these in the same room with my sleeping spouse and never bother her." Value "The MS 400s sounded very good straight out of my iPod and laptop. This quality alone would make them perfect for the on-the-go, value-conscious music lover who still craves high-quality sound without the extra weight and expense an outboard headphone amp." New products, especially ones sold manufacturer-direct, have an especially difficult time gaining acceptance in the picky audiophile community, which raises a question: Who is Phiaton and why should anyone get excited about what they have to offer, especially when they ask you to spend $249 USD on the Moderna MS 400 headphones? First off, Phiaton is a division of Creysn Corporation of Korea. According to the company website, Creysn has a long history of producing raw components "found in many of the best-selling headphones, earphones, and speakers." In a move to gain a larger slice of the economic pie as well as put the company's years of research to a more consumer-friendly use, Creysn created Phiaton to market two lines of full-fledged audio products and three different headphone models in the Primal and Moderna series. The MS 400s are the upper member of the latter group. By combining high-tech design with high-fashion acceptance, Phiaton hopes to make audio equipment that is not only stylish but good-sounding as well. The Moderna MS 400 headphones most definitely are striking to the eye, but how would they sound to the ear? Two aspects of the Phiaton MS 400s jumped out at me right away: the bright-red leather ear pads and headstrap. Since they were not what I expected, they made for a big "wow" factor. Then the carbon-fiber enclosures also caught my attention. They showed that Phiaton wanted to ensure that sound quality was not forgotten, because carbon fiber is an extremely light and rigid material. Its inclusion here means that the MS 400s will weigh next to nothing and that little sound will be lost due to the enclosure flexing. (As an aside, carbon fibers light weight and extreme rigidity are why it is now used almost exclusively in the manufacture of high-end bicycles, where these qualities are highly prized.) Plus, the carbon-fiber weave on the backs of the headpieces looks high-tech cool. The MS 400s are on-the-ear headphones -- sort of. While they are far smaller in circumference than full-sized headphones, their oval shape is also slightly larger than most round on-ear models. If you have smaller ears, the MS 400s will fit comfortably around them. On the other hand, if your ears are large, the MS 400s are going to rest more on their edges than around them. Fortunately, the MS 400s press firmly but without undue pressure, so they are going to be comfortable during marathon listening sessions. Because the MS 400s are also closed-back headphones, proper isolation becomes very important. These 'phones do not use electronic noise canceling, but they still kept a majority of outside noise from reaching my ears. They do an even better job of keeping the music inside with little leakage of sound in, even in the quietest environments. I could listen to these in the same room with my sleeping spouse and never bother her. The MS 400s are fairly lightweight at only 6 1/2 ounces. They come with a one-meter cord that matches ideally with your iPod, laptop or other portable audio device. A 1/8 " miniplug is standard, with a 1/4" adapter included. Both are gold-plated to ensure the best electronic signal transfer. One of the few nits I can pick with the MS 400s is that the 1/4" adapter is a clip-on, not the standard screw-on type, and it comes already attached. Because the user's manual only mentions that you need to disconnect the adapter but not how to do it, I was left scratching my head, until I simply began pulling on the plug and it finally popped off. But its pretty firmly attached. All this should be mentioned in the manual! This brings up my second problem: the manual itself. Its not overly long and is printed in four languages. It offers only very basic information. It doesnt even tell you how to fold the MS 400s into the included hard-sided carrying case, again leaving it up to the ingenuity of the user to figure it out. A better manual, especially considering the cost of the MS 400s, seems essential. I strongly suggest Phiaton update the manual to include all pertinent user information. My final issue is with the design of the MS 400's cable. While its perfect for use with an iPod, its far too short to be used with a home audio system This makes me wonder why Phiaton thought that the 1/4" stereo adapter was even necessary. Unless you plan on sitting (or lying) right next to your headphone amp or receiver, the cable just plain isnt long enough. An added three-meter extension should be included. And nowhere does Phiaton mention what kind of materials the thin cable is made of. As far as specifications go, the MS 400s are the equal of most top-quality headphones. They have decent-sized 40mm drivers and can accept up to 1000mV of output power. They offer a low impedance of 32 ohms along with highish sensitivity of 98dB. This means that they should be able to be used with an iPod at little or no sonic penalty. At this time, the MS 400s are available only via Phiaton's website. The company does offer a 30-day return policy, though it is not as open-ended as that of some other mail-order companies, so read the terms closely. I used two different sources, both with and without portable headphone amps. My main source was my trusty iPod full of Apple Lossless files. My secondary source was either my desktop or laptop computer. With any of these, I added either a HeadRoom Total BitHead or Portable Micro Amp with DAC. I didnt use the amps often because the MS 400s are designed to work well without them. But I did want to see if adding more clean power would affect the sound. I gave the MS 400s a week of run-in time before doing any serious listening. While nothing in particular about the MS 400s' sound jumped out, their overall cohesiveness made them an enjoyable listen. Im not sure what the measurements will show, but if I had to compare them to a full-sized loudspeaker, it would be a Lowther model. Lowthers are single-driver speakers that, together with a low-power amp, have subdued highs and lows but offer a glorious midrange. The Phiaton MS 400s have a smooth overall sound with no rough edges that jarred me out of the sonic bliss they induced. The MS 400s went solidly into the midbass and offered good pitch definition and clarity, though they didnt seem to plumb the absolute depths. Whether I was listening to CD or Apple Lossless files, the low frequencies were solidly handled. The new CD by Stanley Clarke, Marcus Miller and Victor Wooten, Thunder (Heads Up HUCD 3163), was impressive. The MS 400s gave an accurate representation of Clarkes speed and midrange richness, Millers thunder, and Wootens intricate slap-fret work, and the 'phones sounded as though they went deeper than they actually could. Moving up the sonic scale to the midrange -- wherein lies the bulk of the music -- again I was impressed by the clarity of the MS 400s. They do a wonderful job in the midrange, much like Lowther speakers, and they are similar in design and use in that they do not need much power to come alive. Vocals were clear and easily understandable, whether male or female. The MS 400s kept any excess chestiness to male voices at bay. They also allowed female vocals to soar, with no pinched quality showing through. Instead they conveyed each singer's unique vocal style. I love Holly Coles latest self-titled CD (Alert 652810918) due to its standout sonics. The MS 400s conveyed a clear, three-dimensional sonic picture with this recording. When confronted by multiple singers, such as with the Wailin Jennys song "One Voice" from 40 Days (Red House RHR177), the MS 400s did an excellent job of separating each of the three vocalists and their harmonizing. Instruments such as acoustic guitar, tenor saxophone, and piano were also accurately reproduced. Any jazz or blues track that I listened to offered that "in the studio" feeling that should epitomize a good set of headphones. For instance, listening to Little Hatch sing "Rock With Me Baby" from the CD of the same name (Analogue Productions CAPO 2012), I could hear distinctly the raspiness of Hatchs voice, and his harmonica and the accompanying rhythm guitar were portrayed as full-sized instruments, exactly as they would have sounded in the studio. The MS 400s' treble gave a good representation of the frequency scale without any etch or stridency. Their top end is an almost perfect match with their bottom end -- both sounding slightly reduced in energy. By creatively matching the two ends, Phiaton has created a headphone that offers linearity within their given frequency spectrum. This keeps the MS 400s from straying too far, becoming either overly light or dark, which allows them to do a good job of hewing as closely as possible to that straight-and-narrow path between colorations. As is usual with most closed-back headphones, the soundstage is a bit constricted. Yet the MS 400s offered good definition within the space they allotted for the instruments to inhabit. I found I could pick out individual players in even the densest of mixes. To my real surprise, I found that, unlike the majority of high-end headphones, the MS 400s dont need an amp to make them sing. While having that extra power certainly did make them sound a bit cleaner, the difference wasnt night and day. Id say that the low impedance and highish sensitivity that Phiaton included in the design represent smart choices. Sans amp, I did naturally need to turn up the volume, but just a bit. The amp also added a bit more texture and depth to the bass and wiped the midrange window a bit cleaner, opening the top end up slightly. But, again, these were things I expected to hear, so the fact that I heard them didnt surprise me much. However, The MS 400s sounded very good straight out of my iPod and laptop. This quality alone would make them perfect for the on-the-go, value-conscious music lover who still craves high-quality sound without the extra weight and expense an outboard headphone amp. I wish I still had the Denon AH-D1001 headphones ($149) I reviewed last year to stack up against the MS 400s. They would have made for an interesting comparison. Not having those 'phones, I used my closed-back reference headphones, the Beyerdynamic DT 770s ($339) instead. These fall closer in price of the Phiaton MS 400s. The Beyerdynamic DT 770s are full-sized closed-back headphones that fit over the ears. They come in any color you like as long as you like black with silver trim. They reach deeper in the bass with more authority and offer a fuller, richer sound than the MS 400s. Both are a little mellow in the upper registers, but the DT 770s do extend further before their gradual roll-off kicks in. The MS 400s counter with their much smaller, more portable size and far more attractive appearance, together with a more midrange-oriented sonic signature. Two more pluses for the MS 400s are their impedance and sensitivity. The DT 770s need a headphone amp to make them come alive. Without one they will sound dull and lifeless. On the other hand, the MS 400s can be used, and fully enjoyed, without an amp and its added cost. Finally, the case included with the DT 770s is large and soft-sided, as opposed to the hard-shell one Phiaton includes with the MS 400s , which is small enough to slip easily into any carry case or backpack. This hard case protects the MS 400s perfectly. If portability, good looks and midrange-centric sonics are important and you dislike over-the-ear models, then the MS 400s are certainly an attractive option, especially if you don't own and don't care to buy a separate headphone amp. There are exceptions to every rule. The Phiaton MS 400s are one to the rule that companies selling direct arent worth the attention products sold by established dealers are afforded. They offer an appearance that is very definitely not the norm and a sonic signature that will surprise with its overall quality. While they do have one particular sonic aspect that stands out -- their clear, prominent midrange -- what they offer overall is a good sound that will allow for long-term listening enjoyment. They also allow the buyer to enjoy them straight out of the box without the necessity of spending more money on an outboard headphone amp. 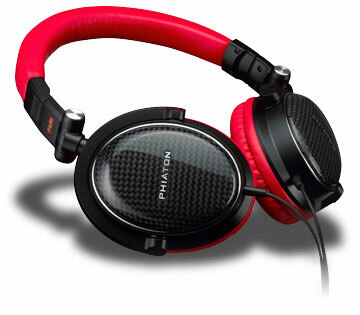 Phiaton has a long road to travel to be the equal of the big-boys of the headphone world, but then those companies arent producing headphones that offer the looks and sound of the MS 400s along with factory-direct pricing. I could live happily with the MS 400s. Check them out and prepare to be impressed.